Today, I am sharing my five most popular items & top five picks and deals. I have pinned all these looks to my stripes board on Pinterest. I found a fun floral skirt with a bow that is an additional 25% off // striped tee on sale for $15 // striped blazer for as low as $25. 1. This really cute tote that is under $30 (and comes in stripes and other colors). 2. Cute & breezy summer dress - in one of my favorite colors - and it is under $30. 3. This $30 sweater in a perfect spring color. 4. This vintage inspired off the shoulder dress would make a statement. 5. One shoulder gingham top - that looks like summer. 1. This biker jacket is 30% off right now. 2. This cute floral cami is up to 40% off. 3. This fun chambray jumpsuit is up to 40% off. 4. This striped off the shoulder top is on sale for as low as $18 with a discount. 5. If you want pair of the popular Tory Burch Miller sandals - these are marked down 33%. I think mixing a floral print with stripes is my favorite thing ever! Great inspiration! You really can't go wrong with stripes and floral! 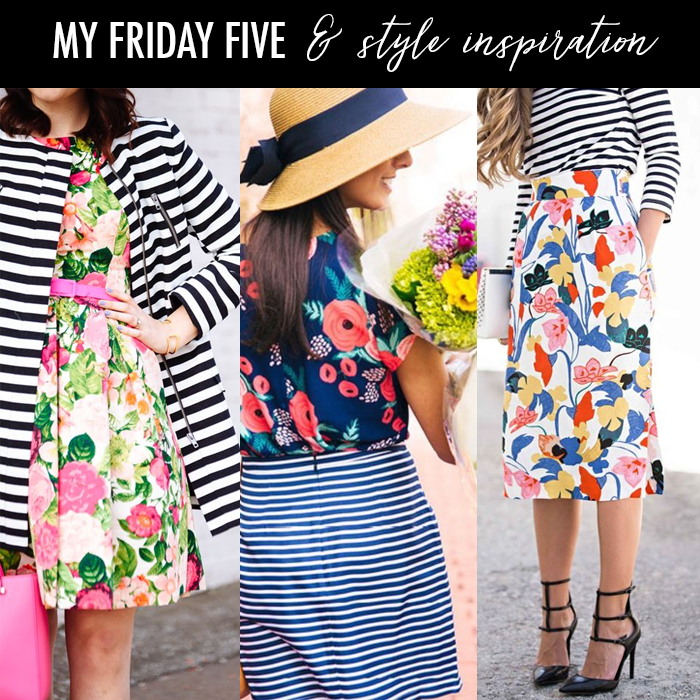 That first outfit...stripes and a floral - so beautiful!